Today, as many of us lead predominately sedentary lives we leave ourselves more open to potential problems like weight gain, poor circulation and tiredness. Over the course of these pages we include a selection of simple, yet highly effective Qigong exercises to help restore the free-flow of the body’s natural healing energies. As part of this ongoing series of Qigong exercises this simple leg loosening exercise will stimulate the feet and ankles, loosen and relax the leg muscles and help to clear blockages in the pelvic region. Because our feet are literally the furthest away from our minds we tend to neglect them. Anyone with an interest in reflexology will know that our feet are a link to the rest of our body and by exercising the feet and legs we can help to ensure a smoother energy flow through the key meridians. Faye Li Yip of the Deyin Taijquan Institute effectively demonstrates this very simple routine for opening and loosening the legs. The movements also provides an excellent primer for the practicing tai chi and qigong routines as well as being highly beneficial for people of all ages and physical conditions. When performing these exercises you should be mindful of your breathing, keeping it natural and regular. Try to develop a sense of your body’s limitations of movement and gently to gradually extend them, without undue force. By working slowly, a little each day, you will feel more open, relaxed and comfortable in your movements. 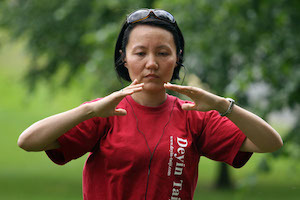 Faye Li Yip was born to a traditional Chinese Martial Arts family in Beijing, China and has, since the age of 7 studied Shaolin Quan, Xingyiquan, Baguaquan & Taijiquan under the tutelage of her father (Prof. Li Deyin). Faye has been based England since 1990 and regularly teaches in the UK and Europe where she encourage students to learn the full Taijiquan curriculum, producing many international medal winners. She is President of the British Health Qigong Association.